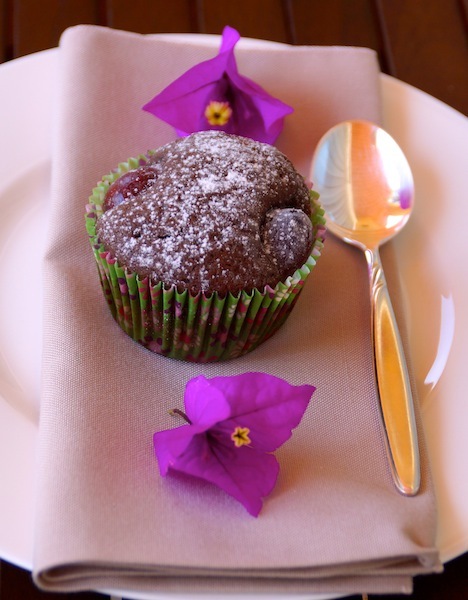 These Coffee Cherry muffins were a pleasant surprise. I have a passion for coffee. I think my father passed it on to me. He had one of these old coffee makers and everyday he would make one or two espressos. When the machine broke down, he would make the espressos by hand. He patiently put a spoon of coffee and then a few drops of water. Little by little he would beat the two together until a foam was formed. Can’t have an espresso without foam! Very young, although I was still not allowed to drink it, I asked him to teach me the secret of the foam. Many times he would allow me to make it for him and would compliment me on my technique. It meant the world to me. The coffee culture in Portugal is part of who we are. There are coffee shops everywhere and many Portuguese don’t usually have breakfast at home. They start the day by going to their favourite coffee shop, have an espresso (which we call a “bica”) maybe a toast with butter and a sweet pastry. Cafes are where you meet with your friends and talk for hours. They are also often used as a study room by many. We have very old and traditional coffee shops in my city, Lisbon. “Cafe Nicola” in the beautiful Rossio square is one of the oldest. Founded in 1787 it soon became a meeting place for many intellectuals and writers of the time. The “A Brasileira” at Rua Garret in Chiado, is another such example. Founded in 1905 it became a favourite place for writers, like Fernando Pessoa, and artists who met and promoted their work there. It is one of my favourite places. I adapted this recipe to my taste from a book called “El authentico sabor del Cafe”. One of the things I changed was the coffee. The recipe asked for instant coffee but as a coffee lover, I obviously had to use real espresso coffee. Another change was the flour. It is really hard to find self raising flour in Mexico so I used all purpose flour with 1 tsp of baking powder. Preheat the oven to 180º C/350ºF. Line the muffin pan with paper moulds. Melt the chocolate in a heat proof bowl over a pan of simmering water. Once it is melted let it cool for 5 minutes. Beat the sugar with the butter until smooth and creamy. Add the eggs, the milk and the coffee and mix until well combined. Sift the flour with the cocoa and then add it to the wet batter mixing it just until the flour is well incorporated. Finally add the melted chocolate and fold in gently. 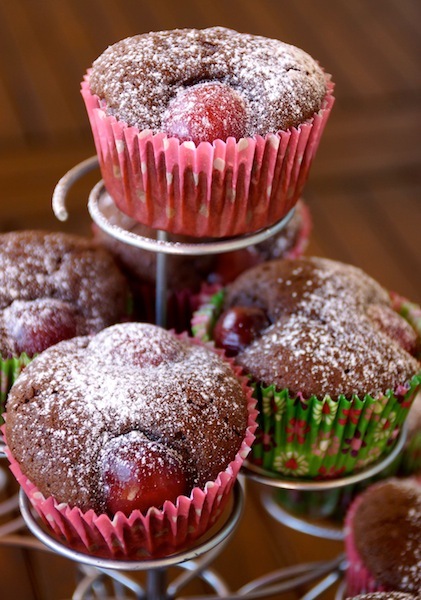 Pour the batter into the moulds and put two cherry halves on each muffin, or two cherries if they are small. Bake for 15 to 20 minutes. For me it was about 17 minutes, they were just perfect, soft and fluffy. The taste is chocolaty mixed with the nice slight bitterness of coffee. Perfect to have at tea time with any kind of coffee or hot chocolate. They must be extremely delicious and you were so right to substitute instant coffee with espresso! Is 1 1/2 tbsp enough, though? I used to buy self rising flour at the Green Corner, in Mexico (I don’t know if they keep importing Bob’s Red Mill products). Anyway, before living in Mexico I had no idea there was a self rising flour and did what you also did. Thank you for your comment Monica.They are great, the taste is different from everything I’ve tasted before. As you must know there are many coffee cake’s recipes that don’t even include coffee. I was happy with the 1 1/2, the flavour really came out with the strong espresso I used. My husband funny enough does not drink coffee so this was really the limit for him 😉 You can use a bit more if you like, maybe to two and tell me how it went for you. I also get it at Green Corner when it is available. However, sometimes they just sell everything and it takes some time to replace the stocks. I can only imagine how difficult that was Monica. In my case it is for having lived in countries where there is always a lot missing. In a way it is good since you learn to survive with little. However, you can’t resist when you see that a new stock has arrived of something you haven’t seen in a long time!